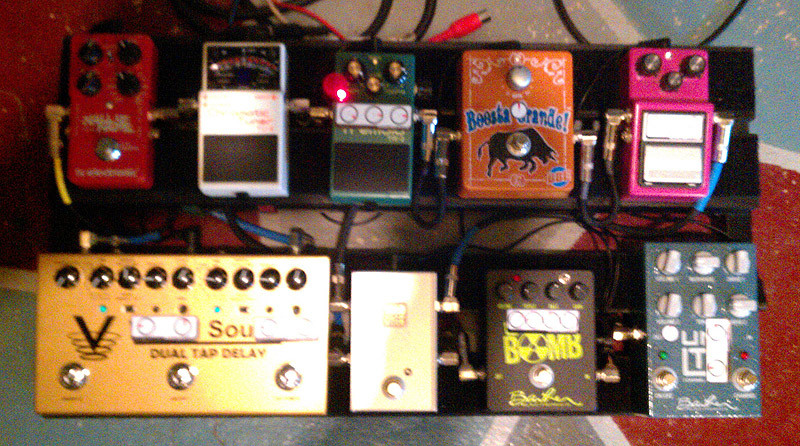 Today’s pedal line is from Chris Sweet. If you have a pedal line (doesn’t have to be in a board) for your rig, please email me a photo, bio, description of pedals and routing to pedalline@nulleffectsbay.com. Every Friday I’ll showcase a pedal line submission. Make sure you include any links to your band or music page. Barber Unlimited 2 channel OD– nice very tweakable version of the Barber Ltd SR (with more gain on tap) with switchable channels. I have this set for low-medium gain applications. Barber Dirty Bomb– Killer high gain pedal. Somewhere in tone range of early Mesa amps. I use it with toggle set to mid boost. The perfect distortion pedal. Period. Ibanez AD-9 – used for thickening solos and all knobs dimed for noisy freakout. BBE Boosta Grande– opamp based for super clean boost. Used for solos and making cleans pop out. While transparent, it seems to thicken everything. Modded Boss TR2– Modded for rate sync blinking LED and volume pot for boost. Used for pulsey effects and in conjunction with ad-9 self-oscilllation for noise making. Boss TU-2 – standard. Works good. Visual Sound Dual Tap Delay– awesome two channel analog/digital hybrid delay with tap tempo that syncs both channels. Simple. Covers my needs. Also has great VS buffer built in. Keeps signal clear and strong when other buffered pedals are out of loop. TC Electronic Hall of Fame Reverb– Set to Church setting all the time. Used for medium to heavy pad-like sounds. Creates washed out sound that can sustain forever. Used for clean, pretty, ambiance. Even if mine is quite diferent I could picture myself overenjoying myself with a similar rig.